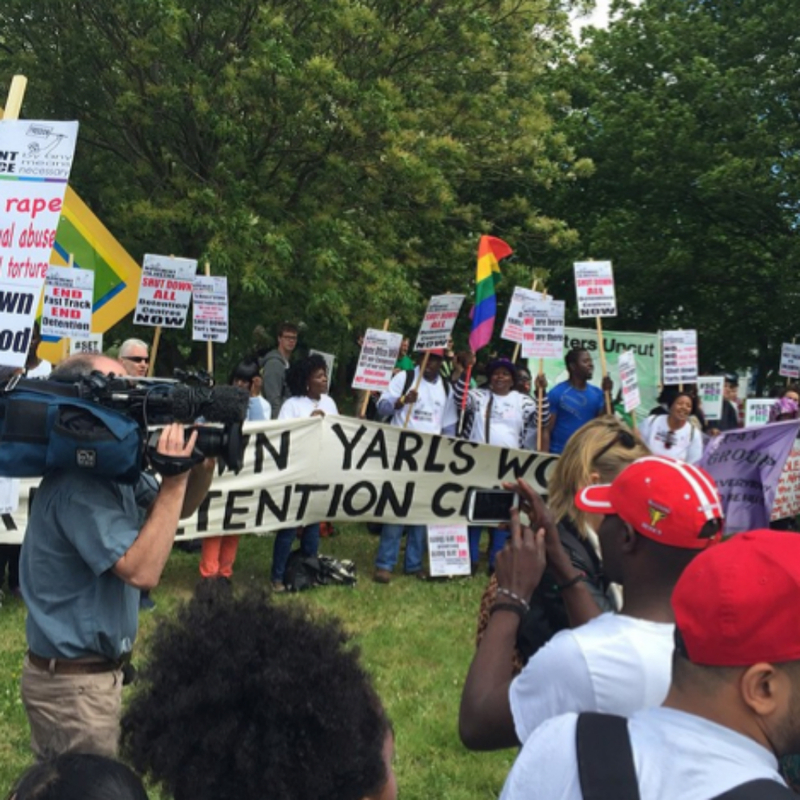 With 400 women detained inside, and reports of violence, abuse and sexual assaults taking place on a daily basis, Yarl’s Wood detention centre has been at the centre of controversy ever since it was created at 2001. But despite documentaries exposing the conditions inside – not to mention testimony from the detainees themselves – it just continues to grow larger, and larger: now housing more than ten times the number of women it was originally built for. ‘I was kept in Yarl’s Wood for a year, so choosing to go back was traumatic. I started having panic attacks when I saw the buildings. I just didn’t feel like myself – I kept thinking: ‘I was once in that place’. It didn’t feel real. And when I saw the women inside, waving through the windows, I found it hard to believe I wasn’t in there with them. You have to understand – when you’re in there, you don’t know how long you’ll be in there for. I thought I’d never see the sun again. ‘We’ve been campaigning to close down Yarl’s Wood for a year and a half now, and there are two strands to it. There’s the healthcare of the women detained inside – the impact that being imprisoned has on their mental and physical wellbeing. And then there’s the way that the staff treat the women too, which is just awful. The fact that it’s criminalising women who have done nothing except ask for help – that’s unacceptable. 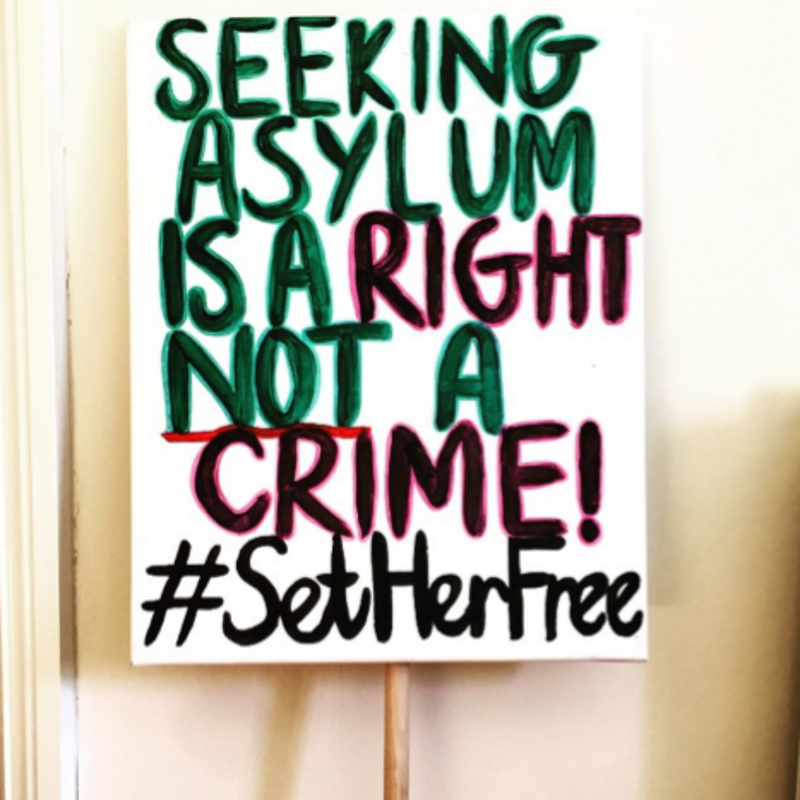 We’ve done all kinds of stuff – we helped out with a documentary with Channel 4 last year, and our hashtag campaign #SetHerFree went viral, too. We’ve also given evidence to Parliamentary Inquiries and independent inquiries too. But we realised that we hadn’t done a physical protest, and after the election, it felt like there was a real appetite for it. ‘Logistically, the day was difficult. We had coaches bringing in people from Manchester, Birmingham, London and Newcastle, but we never anticipated how many would show up. 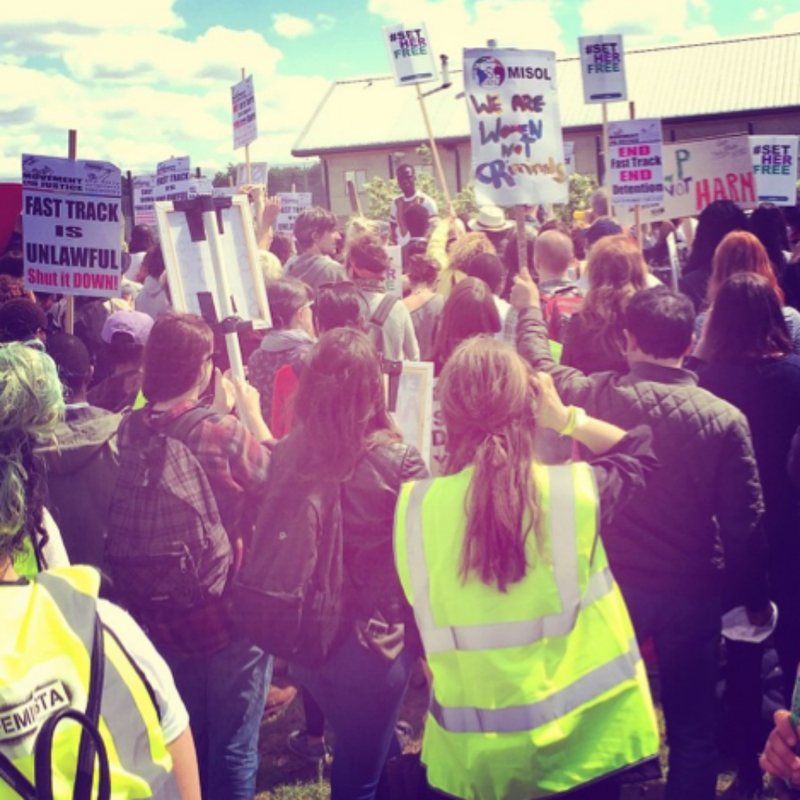 In the end, there were about 700 of us in total – and many of those were refugee women who had been detained at Yarl’s Wood in the past. It was a very moving experience for them – but very hard, too. ‘As a group of women who come together to sing and perform, it’s always been really important to us to support other groups of women too. That’s why we started raising money for Women Asylum Seekers Together a few years ago – they’re such a wonderful organisation, and they’re based in the same area of London as us, so it just felt right. But a couple of months ago, we started talking about how we wished we could do something more to help – something more than just collecting donations for them at our Christmas concerts. Coincidentally, a few days after we’d started discussing this, they approached us, and revealed they were planning to organise a protest, and would we like to get on board. They wanted us to help out with creating a vibrant atmosphere on the day – by singing and chanting. It sounded amazing. ‘We didn’t just want to turn up on the day without knowing anybody though, so we all had a huge workshop a couple of weeks before, where we basically did all of the things that you’d imagine a protest-goer would do. From painting placards to practising chants and singing songs, we we really got into it! We also discussed which songs we should be singing on the day of the protest – rather than just performing our favourites, we wanted to make sure the messages we were putting out were the right ones. We found out that a branch of WAST in Manchester had actually written a song for the day, too, so we practised the words. For once, there wasn’t really much focus on the technicalities of our singing – it was more about knowing the lyrics and singing them with the most enthusiasm and energy possible!